We’ve known for years that exercise reduces anxiety, but pair it with meditation before or after your session, and you may find that your anxiety begins to melt away. That’s according to a new study published in the American Journal of Health Promotion that found meditation paired with ten minutes of walking significantly reduces anxiety. Using the State-Trait Anxiety Inventory questionnaire, researchers at the University of Mississippi found that adding a meditation before or after a ten-minute walk reduced anxiety levels in university students far better than a ten-minute walk. Unfortunately, the lone ten-minute walk showed little to no change in subjects’ anxiety levels. That’s not to say that exercise isn’t beneficial for people with anxiety; it’s just less effective than meditation and exercise combined. There’s ample evidence that suggests long-term exercise helps improve people’s mood. Some therapists, like Dr. Jennifer Carter of the Center for Balanced Living in Ohio, now incorporate gentle exercise into therapy sessions — getting patients walking while they talk — because it’s so beneficial. Exercise is even better for your mental state if you adhere to a regular routine and stick with it. As Duke University clinical psychologist Dr. James Blumenthal states, “people who were active and stopped tend to be more depressed than those who maintain or initiate an exercise program.” In a series of studies, Blumenthal and his colleagues assigned adults who live with major depressive disorder and also lead sedentary lives into one of four groups: home-based exercise, supervised exercise, antidepressant therapy or a placebo pill group. After four months, the team found that people in the exercise and antidepressant groups experienced a remission of their condition at higher rates than the placebo group. In short, exercise gave patients a comparable result to antidepressants. The interesting part is that a year later, Blumenthal and his team followed up with the subjects. Those who continued to exercise regularly experienced a remission of depression and anxiety symptoms than those who stuck with the antidepressant therapy alone. Various other studies reinforce Blumenthal’s research statements, and as the Anxiety and Depression Association of America reports, physical exercise helps reduce fatigue and improves cognitive functions, which can help make your brain and body feel better. Exercise also releases endorphins, our body’s natural painkiller, and helps you sleep better. When your body is functioning at its optimum state, it’s easier to release stress, as well as overcome anxiety and depression. The good news is, if you already exercise, you’re off to a great start. Add some meditation to the mix before, during or after a walk a few times a week and enjoy even more stress relief. If you feel pressed for time or, if you want to try some anxiety relief on your lunch break, give a walking meditation a try. Whether it’s a park outside your office or your very own street, find a place where you can walk peacefully and without interruption. Some people find that walking ten to 15 paces back and forth in their backyard provides the opportunity for walking meditation without fear of looking silly to passersby. Notice how you’re already breathing and then deepen that breath a bit if it feels good. Take a few breaths before you begin walking to center yourself. Before you begin walking, notice how your feet feel on the ground. You may also notice that you can feel very grounded by just paying attention to that connection between yourself and the earth. As you walk, notice as much about each step as possible. This includes how your foot lifts, is placed before you, how your weight shifts from one foot to another, and the gentle cycle of your walk. 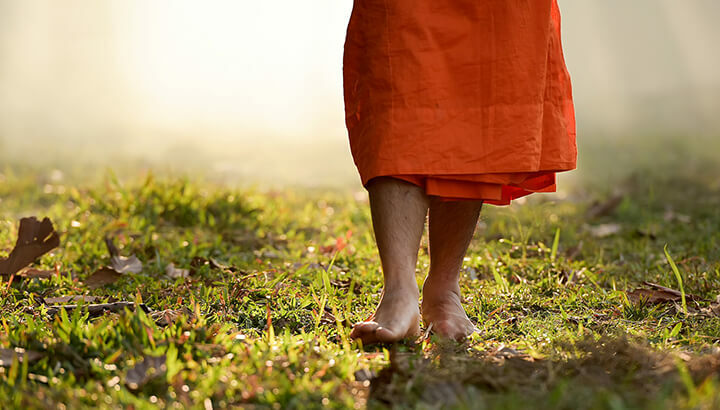 According to Jon Kabat-Zinn’s Mindfulness-Based Stress Reduction (MBSR) program, the best way to practice walking meditation is through small steps and a slow pace. Don’t stress out too much about how quickly or slowly you’re moving. Walk at a natural pace and hold your hands and arms in any way that’s comfortable: at your sides, hands clasped behind your back or with your hands in your pockets. Take this time to also notice the things we often take for granted: your breath, the sway of your body, the balance in your shoulders, neck and head, or how you create sounds with each step. The point of this meditation isn’t arduous, silent meditation. It’s about stress relief and bringing your anxiety levels down. 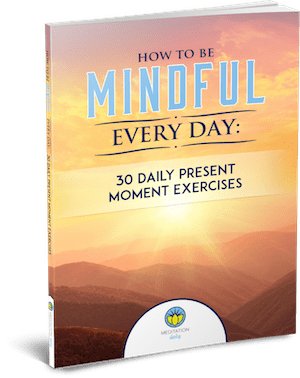 When your mind wanders, bring it back to the present by tuning into your body or your breath. But, if you begin to think about the birds singing or the sound of a natural water source nearby, enjoy the moment.